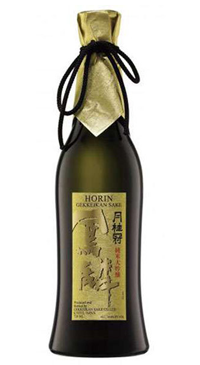 This is premium sake is from the Fushimi region in Kyoto, Japan. A combination of fresh spring water, Yamada Nishiki rice (known as the ‘king of sake rice’), Gohyakumangoku rice milled to 50%, and the skill of the sake master, result in this classic example of a Fushimi style Junmai Daiginjo. Mild fruity aroma with delicate notes of over-ripe cantaloupe, honeydew and honeysuckle. Round and smooth on the palate, with a medium, creamy body. Finishes long and smooth, with a hint of pear. Horin’s delicate aromatics complement lightly seasoned appetizers, salads, lobster and mild fish dishes, glazed pork, fresh fruit and lighter style fare. Best enjoyed chilled. Sulfite and gluten free.